Description: It's Halloween time and this princess wants to try on a whole new Pastel Goth style to go with it! With your help she'll dye her hair black and enjoy a wonderful spa session. 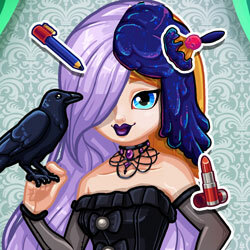 Try on edgy make-up, and then pick out her dress, hairstyling, jewelry and pets.